He’s thought to be the first international recruit to sign with a Power 5 school as a QB. Some signees will announce on ESPN in front of thousands of eyeballs. Others will commit in packed high school gyms in front of their peers. But Luke Wentz planned to be 4,000 miles away from his college, at the home of a future teammate as he made history around a low-key gathering of family and friends. On Signing Day eve, he was calm, speaking in his second language. But when considering how Wentz got to where he is, the possibility of him starting for the Cavs behind center is a big deal. Peter Daletzki only had to see him throw three or four times. In 2015, Daletzki was running a tryout in Germany. As an offensive coordinator, he naturally was looking for a quarterback. It didn’t take long. “I turned around, looked at the head coach, and said ‘ok that’s my quarterback,’” Daletzki, of the German Football Academy, said. “It was like, sometimes you kinda have this feeling when you see a person and it’s like the first impression, and it kinda blows your mind on how that person already throws the ball and how he launches the ball over top. It all looks like it’s out of the book. The Daletzki connection explains why Wentz fits UVa. Daletzki learned the game as a teenage foreign exchange student in Michigan. When he returned to Germany, he played, then decided he’d be better as a coach. His influence came from a retired high school coach who taught him Tony Franklin/Mike Leach air raid staples. No-huddle, signals, wristbands, and tempo — Wentz was weaned on air raid principles. When Bronco Mendenhall took over Virginia, he brought Robert Anae as offensive coordinator from BYU and installed the air raid. Anae was Leach’s offensive line coach for four years at Texas Tech. He also played at BYU, where Lavell Edwards laid the foundation for what Leach & Co. built on. Virginia has rolled some of that scheme back and built a different style around Bryce Perkins, but it is easy to see how the Cavs could value an air raid student like Wentz. Virginia offered Wentz as a QB/ATH, but made it clear they were serious about trying him at quarterback. On his official visit in January, Wentz watched film with QB coach Jason Beck. They reviewed the Cavs’ bowl game and talked about what the QB would do in game situations. Wentz bucked a trend by growing up to play our football instead of soccer. Humiliating performances by Germany in the UEFA European championships kicked off a revitalization of the youth soccer system in the early 2000s. Money pumped in, and a decade later, Germany was back on top, fueled by a youth movement with stunning levels of participation. But Wentz grew up as the son of a baseball-playing dad and a softball-playing mom. He picked football up in 2011, starting as a wide receiver. After three years, he switched to quarterback because his team didn’t have one. Eventually, Wentz moved to a boarding school so he could train six times or more per week year-round. 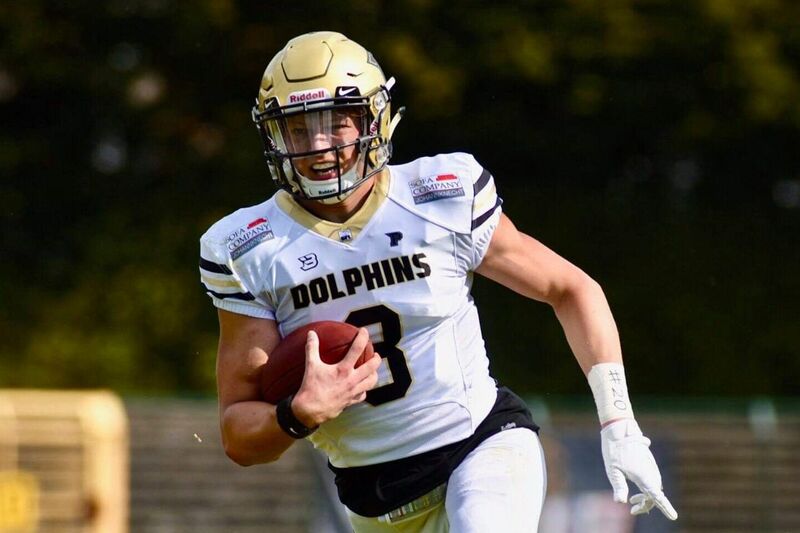 There, he quarterbacked the Paderborn Dolphins U19 team to back-to-back Junior Bowl championships under Daletzki. Wentz is raw, but the physical talent is there. He was clocked at a camp with a 4.6-second 40-yard dash and a 10’6 broad jump. If he was older, those numbers would impress at the NFL Combine. His 6’3, 205-pound frame can use some more weight on it, and he’ll likely get it in a Power 5 strength program. His tape shows a compact release and good footwork. He likes throwing post routes, and he’s got a big arm. But there is way more to quarterbacking than just physical tools. The game will speed up considerably. When asked to self-scout, he admits mixed coverages (where one side of the secondary plays zone and the other plays man) give him trouble. He told a German publication he thinks he can play when he gets here, but he’ll likely benefit heavily from a redshirt year. When asked to describe his style, he names Deshaun Watson — a quarterback who can move and likes to do so on designed runs, more than freelanced scrambling. If he ends up being Mendenhall’s diamond in the rough, his impact will be felt in countries beyond even the two Wentz will call home. Since 2017, former UMass defensive lineman Brandon Collier has been traveling Europe, trying to connect recruits with American colleges. He runs a scouting service in an emerging industry called PPI Recruits. He deals with 100 players spanning three classes in as many as 12 countries. Over the summer, Collier led an American tour for 20 European players. On this trip, after a drive from Florida to Virginia, Wentz performed for Virginia coaches and got his offer. Wentz isn’t Collier’s only major talent. He’s got a 2020 prospect committed to Notre Dame. Michigan signed one of his players last year. Temple’s offered his players. So have Penn State and Florida. Wentz isn’t even the only player PPI is sending to Virginia in this class. But Wentz is different, frankly, because he’s a quarterback. “I think that’s a culture changer. That’s something that they always said — you can get the linemen, but no skill players, especially quarterback, can go Power 5,” Collier said. “For PPI, it’s the biggest — I don’t think maybe we’ll ever trump this story. It’s monumental, and I’m proud to say that I and we helped to deliver this. American football isn’t new in Germany. They’ve been playing in organized pro leagues since the 1970s, before even NFL Europe showed up. German leagues are thought to be the best in Europe from an athletic and schematic perspective. But just like soccer long fought for legitimacy over here, American football does in Europe. Whether Wentz pans out or not, he’s opened the door with only a signature. Now the real work begins.